Nails are all the craze right now but if you are like me, you don't want all the hassle. I just found out about Jamberry Nails and they are a really cool way to add some wow to your nails in no time and they come off without damaging your nails. They don't add length to your nails as they fit over your existing nail but they really can add some jazz in little time. You can put them on acrylic and gel nails too! 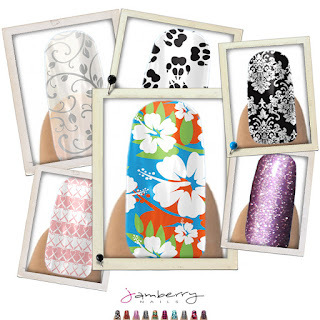 Jamberry nail shields are a solid film covering that are made in the USA using no harsh chemicals, and they are laytex free. They can last up to 2 weeks on your fingers and up to 6 weeks on your toes! Unlike nail polish there is no chipping, fading or drying time! With over 200 styles there is sure to be something that will catch your eye. Check out the YouTube video below to see how easy they go on and off. It is Jamberry Nails 1 year anniversary and every Friday in July they are having 1 shield style for ½ ($7.50) off along with free shipping with orders over $50! Which is basically the buy 3 get 1 free plus the 1/2 off one and you get 5 sheets for $52.50 + plus their tax. Check out Independent Consultant's Melissa Henderson Facebook page on Friday morning to see what shield is going to be on sale or visit her website, select 'Buy Jamberry' and it will be the very first thing in the list of products there. Did you know you can also host a party and earn free or discounted nail shields? Just click here on hosting a Jamberry Nails party to find out more! Summer special of Buy 3 get 1 FREE ends August 31st! Melissa Henderson, Jamberry Nails Independent Consultant, is providing one of my readers with two sheets of your choice of Jamberry Nails! I would like the pink camo or the paint splatters. Any of the Black and Whites! I've been wanting to try some of the sparkle ones, so I'd try the silver and gold fishnet and maybe the onyx sparkle! I love the purple and gold argyle and the white skulls on black! I love the Black & White Chevron, and the city plaid. I want so many of these!!!!! Thanks for the giveaway! Black and White Damask and Silver Floral on Magenta are my favs. I like the Small Multi Polka and the Lavender Sparkle. I would choose the Vibrant Pinwheel and the Colorful Leopard. OMG they are so nice I would love to win... the blue with the daisy's would be nice!!! There are so many great choices! I would want the darkest black, and the flames!!! Star of David and Peacock! pink zebra and leopard. they are all sooo cute!! I would love the Holographic fireworks and the black and white Damask. I would love Black & White Damask and the Holographic Fireworks. I would go for diamond dust sparkle and the green and white stripes one. I love the burgundy floral, black & magenta lace and the taupe vintag rose. All of them are great. Baseball and Metallic Chrome Silver!!! I like the blue/orange argyle and the blue/white whimsical swirl!! I like the pink butterflies. I would choose the flipflops pattern and the Breast Cancer awareness. I like the Silver Floral on Magenta and Skulls & Checks the best. But really, I love all of them! Because I am a 'Country Girl' I would choose cow and snakeskin! I would love choose Black & White Paisley and Blue Modern Flower. I like the burgundy floral and the matte silver check! I would pick Diamond Dust Sparkle and Taupe Vintage Rose! They are all awesome! I'd try dark blue paisley & Magenta/silver plaid. I really like the Gold Sparkle & the Paw Prints one too. Hard to pick only two favorites though. I would love to try the Pink & silver Fishnet and the metallic Whimsical swirl! those two are CUTE! Cupcakes and White Stars on Pink. pink zebra and summer pinwheel. I choose birds and christian fish, too cute! I like the gray ans white lace and the black floral. Aqua Green and Black Floral for me!!! Black Floral and Aqua Green!! I like the black and magenta lace and the burgundy floral. I would choose Pink & Purple Pinwheel and Cross. Thanks for the chance! Orange & Black Horizontal Stripe and Spider Web would be my two choices-I <3 Halloween! I like the classic french tips and the Christian fish! Spring flower, black & white paisley. blue aloha flower and aloha flower. These are so pretty it was very hard to chose. there are a lot of very cool ones, but if I have to choose just two, I would choose Magenta and Silver Plaid and Purple Green and Black Plaid. There are sooooo many but I would have to say the flip flops and the gold butterflies!!! Two of my most favorite things!! I would choose Leopard and Black & Magenta Lace. I like the "Raspberry sparkle" and "Colorful Stars" Thank you for the giveaway. Black floral and French tip short. I like the breast cancer awareness and Magneta floral on clear!! The raspberry sparkle and black stars on white! I like the Peacock and the Giraffe nails. I would choose Blue Modern Flower and Gray Plaid. I would pick the blue aloha flower and the silver gold&black plaid. French tip (short) and Magenta Floral on Clear would be my choices. Blue Leopard and cupcakes , Thanks! I would get black floral or the solid burgundy! I would loke black floral and purple zebra. But, wow there are so many to choose from. I like several from the black and white collection and the bridal collection. aqua plaid and aqua green. Mulberry flower on tangerine and red polka. These look so cool. I'd choose Mint Green Chevron and Pink & White Heart Collage. I like the Pink Zebra and Aloha Flower. Birds and USA limited edition. Silver Floral on Magenta and Black Floral. I like Blue Camo and Blue Leopard. I would choose French Tips Medium and Magenta. Silver Floral on Clear and Black & White Damask. So awesome!